It is hard to be truly innovative. Completely creative. Come up with an idea that is genuinely original. Chances are anything that we create today, someone else has already come up with it. That is one of the hardest things for me as a craft blogger. I try to come up with creative things to inspire my readers. The reality is that whatever I come up with - many of them have already seen something similar. This isn't because I copied someone else's idea. I might have been similarly inspired. Or that the idea was so awesome that it couldn't be contained in just one mind. Or I might just be behind the curve a little. It happens. Someone once told me that there is nothing new under the sun. 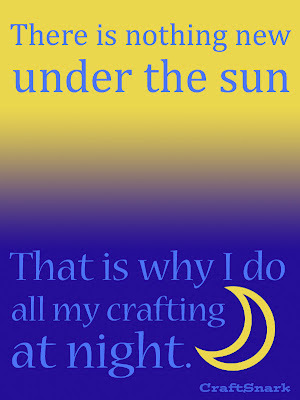 I guess that's why I do my crafting at night.